Mali generously shares her experiences thrifting in the Arctic with her blog Arctic Mum. I've always lived in tropical places, so Mali's story strikes a chord with me. I'm so pleased she's sharing her thrift story from a location that's so exotic and fascinating to me, and surely, you too! The Arctic is so far away and exotic to my tropical palm-tree heart and soul. Tell me about where you live and what it's like! I collected things as little, and I've always loved flea markets. When I got together with my partner ten years ago I dragged him around to flea markets, and I've just continued, and the thrifting interest has grown. What do you think makes thrifting in The Arctic different than thrifting in the United States or other places in the world? The Arctic - or the Norwegian coast - has a strong history of fishing culture, and people were quite poor. You don't find many antique objects here - like in France, but rather more steady objects like teak and respatex tables - things in everyday use for the fishermen or farmers. I see a lot of Pyrex on American blogs, but never spot it here. I think the American housewares were a bit more sophisticated at the time. What are the names for "thrifting" in The Arctic? Any special nick names? "Fretex" is the Salvation Army shop, "Loppis" which is slang for Flea Market, "garage sale." Is there a large thrifting/junking/second-hand shopping culture in The Arctic? No, I wouldn't say that, but you certainly spot the same people at fleas! The market is not big, since the range and selection of objects is small. I'm always surprised to find great things, because that doesn't happen every time. And the competition for teak objects has sharpened. Is there a stigma against second-hand shopping in The Arctic? Is it seen as something dirty or something for low-income families? Not at all, even though my vintage thrifting is met with both curiousity and laughter. But maybe there's a difference between those who must buy clothes at the Salvation Army, and those who go there for vintage thrifting? I have bought all the baby gear this time second hand, and no one lifts an eyebrow. Are there any flea markets in Arctic? What are they like? Not that many, and usually not that good. Usually organized by school classes that need to raise money for trips. But I always find something! And we make it a family outing, have waffles and the kids get to pick one thing each. Are there many dumpster divers and curb-side hunters in The Arctic? Oh, I think those dumpster divers are non-existent. I think they may be a myth here. And it's not common to set things aside on the street for others to pick up, I've never seen it happen. The renovation people would probobly ring their door bell and tell them off! Is there a large thrift and craft culture in The Arctic? I think garage sales have been seen like something not-to-arrange, but lately I've seen more and more ads for them in the newspaper. But I don't think it's that vintage related, it's more to get rid of furniture when moving etc. I've only been to one estate sale here, and that was crazy! Sooo many people. Usually professional dealers clean estates, but I don't know what happens to everything. What are thrift stores like in The Arctic? A little...mix of everything. You really need to have an eye for things, because for most of the part it's not interesting. 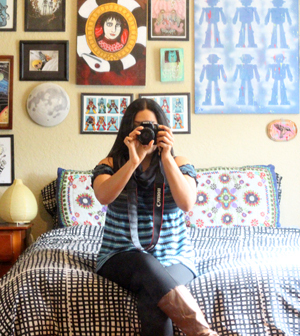 Your home and thrifting finds are clean, colorful, and playful. 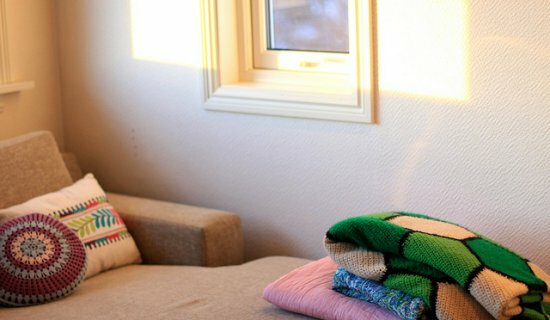 What are your main inspirations when it comes to thrifting and home decor? 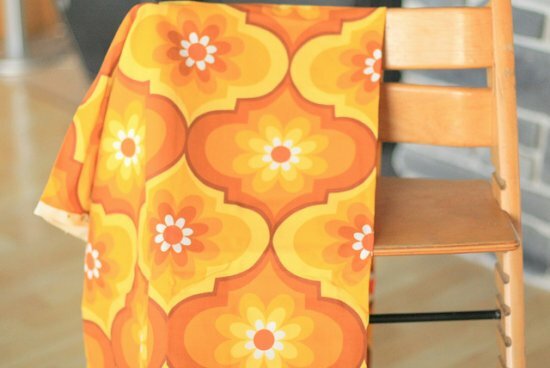 I like 60s and 70s decor, mainly 60s. But the house shouldn't look like a museum, but have a contemporary vibe with some thrifted objects - that's not taking over. Mad Men is a huge inspiration of course, and thrifting must have gotten a whole new meaning for ordinary people after that series! 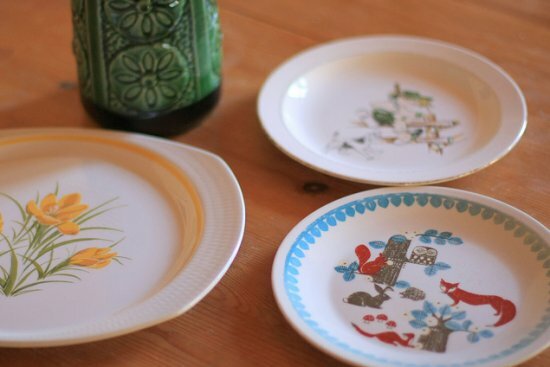 I have a weakness for old plates of Norwegian manufacturers like Figgjo and Stavangerflint. I think they exported lots to the US in the 50s-70s so you can find it there too. But here that's one of the more common finds, and not rare. I like 70s objects that are colourful, and of course teak objects like my beloved cabinet that I fought for at the estate sale I attended. And lamps! Other thrifted related bits: Late at night I usually persuade my partner to watch Cash in the Attic US or UK with me, when we really should go to bed. I think I may have managed to grow a thrifting interest in him too! Women can be smart. * First photo from This Arctic Mum Post on Svalbard, the Northernmost populated place on earth! i love all these interviews. this location seems the most "exotic"! Jessica and Drew: I was so fascinated, too. And eager to get the questions back! The Arctic is an exotic faraway wonderland for most of us! I love Artic Mum's site! Fun to read an interview with her! I love your interviews, it makes the world seem a tiny bit smaller. Dhamma: I was thinking the same thing, especially considering how far away the Arctic is for many of us! This is so interesting! I'm going to track back and read the rest of the series now, I'm hooked! Great interview. wow. this is awesome! i am so following this blog! is that a hammock in her living room? I love her sense of style and the information is so interesting. 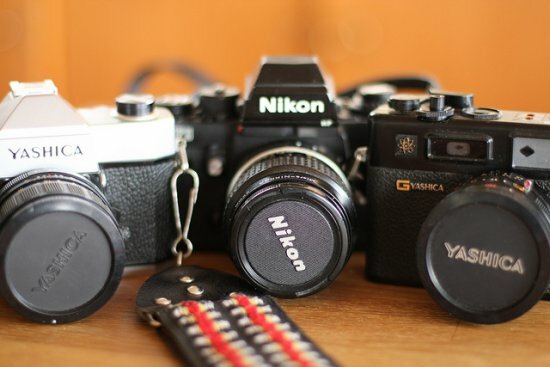 don't you just want to travel the world and thrift? I'm starting in Scotland in September, so if you have an interview with a Scottish thrifter hiding in the queue, i'd love to read that!!! Lisa: Thank you! It's a lot of reading, but everyone had something special to add to the global thrifting conversation! 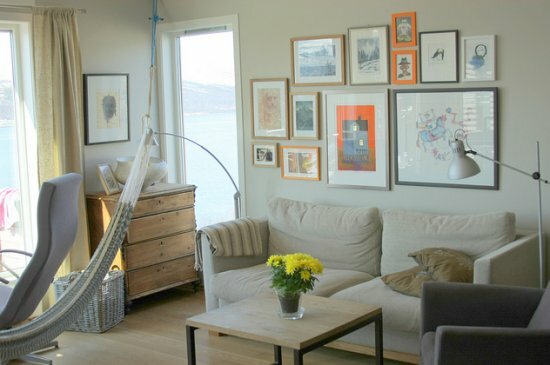 Angelika: I was thinking the same thing- I love how the hammock fits right in and looks perfectly inviting yet classy! I need to hunt down some Scottish thrifters, I'd love to chat with them! Just popping in to say thank you for the interview, and warming comments (could certainly need that, back to 8 degrees celcius now). Thank you Vanessa, I feel famous! Me too think thrifting is a real world wide common thing that unites, and it's interesting to have a peak into eachother's worlds. For me it's likewise fun to see how people live in warmer places! I'd better not let my boyfriend see the picture of the hammock in the living room though - we are battling over where to hang our (much uglier) hammock in the garden! Mali is a great person and we both love vintage..
Mali: And thank you for answering our questions and satisfying our curiosity, this is one of my favorite interviews!